The Gartshores first came to Quorn around 1860 when George Gartshore (born 1830) became a farrier to the Quorn Hunt. This original George Gartshore was the grandfather of George Harry Gartshore who is shown in this photograph with his wife Olive Gartshore (nee Cutts) and their nine children. 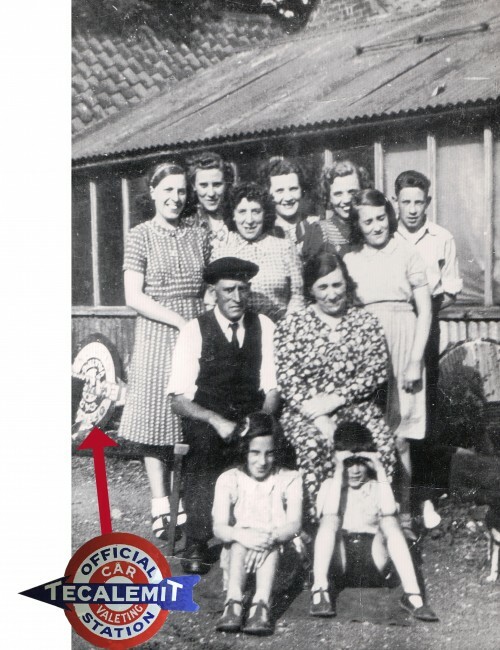 This photograph was taken in the early 1940s when the family were living at 15 High Street. This was next to the Methodist Church and a garage. If you look closely there is a sign on its side to the left of the family. Careful examination revealed this to be a garage sign for Tecalemit Valeting. It is amazing what modern technology can reveal from old photographs! Top row, left to right: Dorothy, Irene, Lavinia, Mary, Nell, Hilda and George. Middle: George and Olive Gartshore (parents).